Here at Forge Distribution, we’re so excited to share with you the new products that are rolling in and feature updates being made. We live in a digital age and smartphones are becoming an important hub for controlling devices within our home. 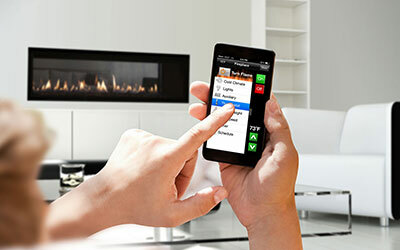 New controls and a Wi-Fi app, make it possible, among other things, to turn on your gas fireplace from a distance so you can arrive home to a warm space. You’ll be able to view fireplace settings from anywhere, ensuring it’s been turned off after leaving and allowing you to monitor fireplace usage by others in the home. If you’re a parent, you’ll be able to engage a child safety lock feature to prevent unsupervised use. It also provides intelligent information, performing quick diagnoses and providing troubleshooting options, even reminding you who your local installation professionals are. It has a programmable thermostat setting that will automatically maintain the desired temperature, and settings to adjust flame height, interior lighting effects, fan speed control, and timer. It’s super cool. The app will be for both iOs and Android smartphones and tablets, and will be available on select products in the near future. These new gas fireplaces reflect the growing trend for clean, modern fireplace designs with a linear shape, flush-to-the-wall installation, and low-profile trim. Active flames span the full length of the fireplace, and softly reflect off the black glass interior. Clear LED under-lighting illuminates the firebox from beneath a bed of crushed glass, creating a stunning effect that can also be enjoyed when the flame is on or off. You can customize the look with seven colours of crushed glass, including iced fog. MEZZO Series fireplaces are more than beautiful – they’re smart too. They feature the IntelliFire™ Touch Controls discussed above. 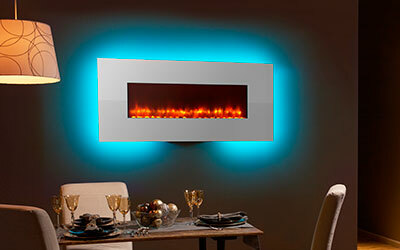 Included in the series will be three fireplace sizes: 36-inch, 48-inch and 60-inch. Each size will be available as a single-sided or a see-through fireplace. Stunning modern design and efficient heat output have never been this simple! REVO Series gas fireplaces are among the thinnest fireplaces ever made with 7-inch deep profiles, making it possible to install or hang them on a wall just about anywhere! They are available in three models: square, linear and vertical. Their shiny black glass interiors add depth and reflect flames that rise elegantly through an invisible patented Razor™ burner for a mesmerizing flame experience. You can choose from three decorative front options, and ambient backlighting options are available in multiple colors to match décor, or perhaps your mood. Their slim design is highly efficient, producing up to 24,000 BTUs output. The shallow depth of REVO Series fireplaces maximizes floor space. They can be recessed into a wall, or installed flush on a wall. The lightweight units are simply hung on mounting brackets – no additional framing is required. So easy and so beautiful. Check out the REVO Series! 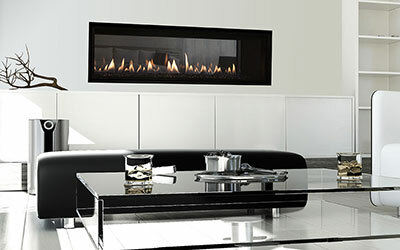 The Heatilator Crave is linear modern fireplace design at its best, and for a competitive price. Crave series gas fireplaces come standard and ready-to-install with crushed glass media, minimal trim and a safety barrier screen. You can customize the look of your fireplace with optional upgrades, including additional colours of crushed glass, logs, clear LED lights, and your choice of two designer fronts. Crave fireplaces come in 36-inch, 48-inch and 60-inch sizes, and each is available as a single-sided and see-through fireplace. The Heatilator Crave also features the NEW simple, smart, and safe IntelliFire Touchscreen Remote Control system. • Wall-hung fireplaces. 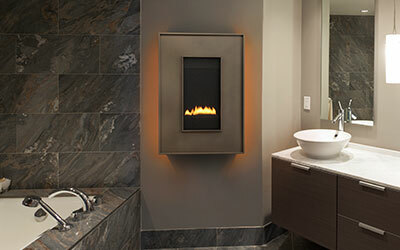 SimpliFire’s wall-hung electric fireplaces are urban chic contemporary with stylized lighting and clean glass fronts. You can choose from models with multiple flame colors and up to 14 brilliant colours for LED firebox backlighting, as well as perimeter lighting options. They’re available in 36-inch, 58-inch, 70-inch, and 94-inch sizes. • Built-in fireplaces. 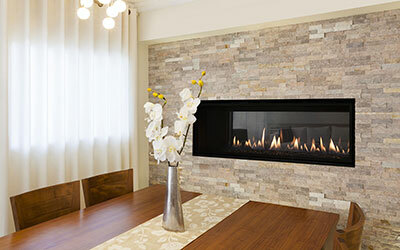 These are for a more traditional flush-to-the-wall hearth experience. Installation is simple since no venting is required and you can customize them with mantles and surrounds to perfectly complement home décor. SimpliFire built-ins feature detailed masonry-style interiors, textured log sets, glowing embers, and LED accent lighting. Welcome to the next generation of fireplaces!